Unisex and androgynous are words and looks we are embracing more and more each year. I especially love wearing matching unisex jewellery with my boyfriend. A couple of years ago my boyfriend and I bought matching Shaun Leane earrings. 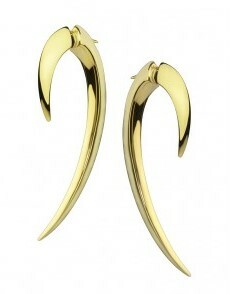 Mine are in yellow gold vermeil and his in sterling silver. We went for the size 1 talons as this suited both of us. Every now and again people might notice we are wearing the same earrings. 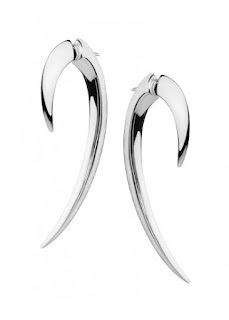 What makes these earrings beautifully unisex is they are really simple earrings with a high impact look. The talon shape is neither strongly feminine or masculine. They are not overly thin or thick so suit both of us when we wear them. We both love wearing them to the office as they are a little edgy but this is balanced by the sleek and simple design of these earrings. These earrings were on my wish list for a very long time and it was a great reason to buy them as he wanted a pair as well. We've been eyeing up the pairs with diamonds, on so perhaps our next purchase will be a little bit more sparkly.